Clothing: Best to wear something snug that covers underarms, midsection, and backs of knees. Note: Good to come a few minutes early to start warm up and stretching prior to the lesson. If possible, come on bike and already be warm! 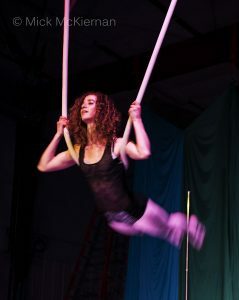 Karen Nellessen took classes in trapeze, silk, lyra and cloud swing in 2010 at her home circus in Bellingham, WA before settling into cloud swing as her specialty in 2012. She was a regular member and performer at the Bellingham Circus Guild from 2012-2013. When all the nieces and nephews started coming, Karen moved to Madison, WI to be closer to family and joined the Madison Circus Space in 2014. Karen has been a regular performer on cloud swing and silks at various MCS shows since joining, and can’t wait to give her students that “wind in your hair” experience that comes with swinging. She was just approved to teach lessons in 2016 at MCS. Her background as a Physical Therapist informs her ability to work through places where students get stuck, with special attention on preventing injury and helping protect students who may have chronic injuries.